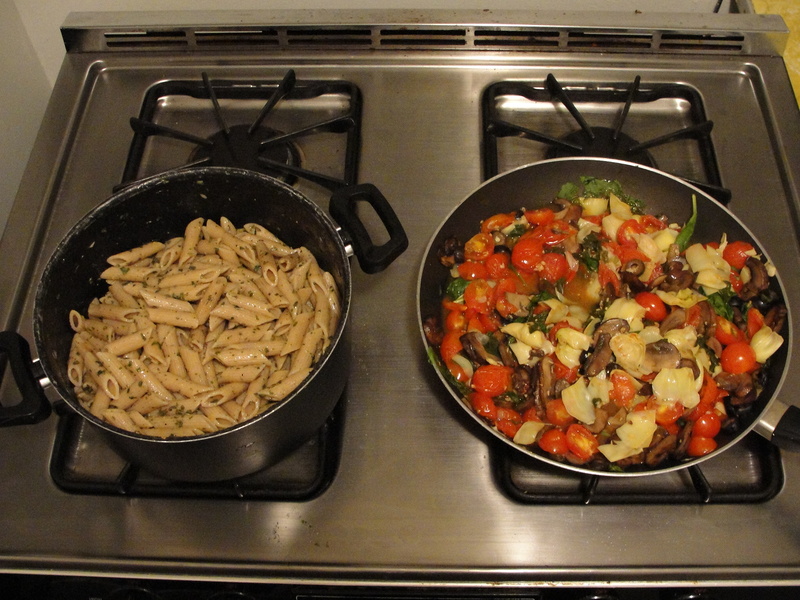 Wash all of the produce and rinse the canned olives and artichoke hearts. Begin sautéing the mushrooms and minced garlic in olive oil (separately). 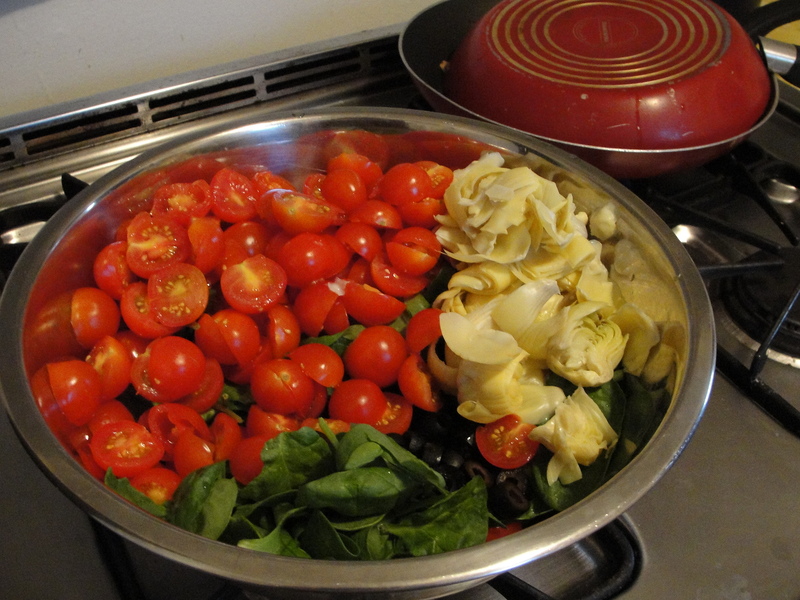 Slice the cherry tomatoes and artichoke hearts in half (removing the bottoms of the artichoke hearts). Drain pasta and put back into the pot. Now, here is the thing. I have always made the “sauce” to taste, so I have no idea how much I usually use. I tried to pay attention tonight, but I suggest just going slowly and tasting often until you’re satisfied. I start by pouring olive oil (about 6 tablespoons) in with the pasta, then add butter (about 2 tablespoons), stir, add salt and (a lot of) pepper, garlic powder, and basil (about 3 tablespoons) … stir and taste, then maybe add more, maybe not. 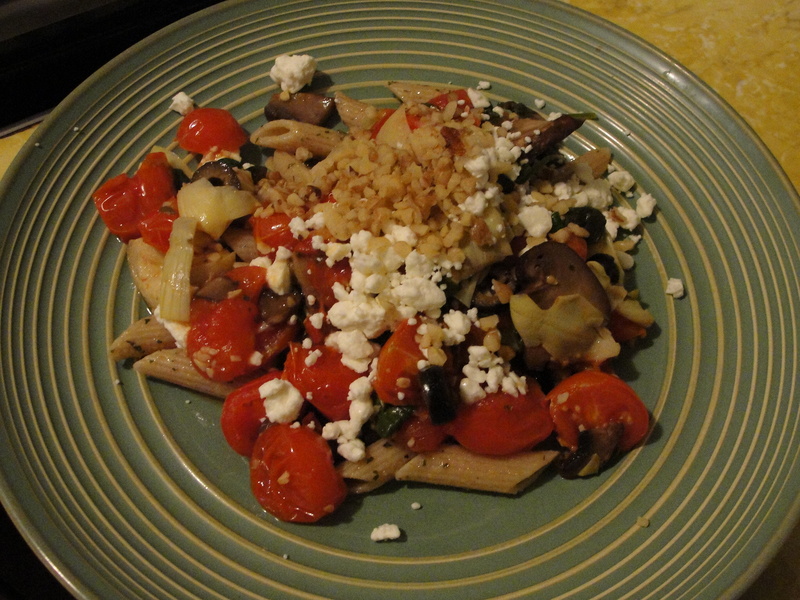 Plate the pasta and vegetables; sprinkle feta cheese and chopped walnuts generously on top. Eat! *Meanwhile, nicely ask your boyfriend to go to the liquor store for more wine because you just remembered it’s 8:45pm Saturday night and you live in Oklahoma. Looks awesome! didn’t you make this for me last time I came over? Seems like I remember eating something that tasted as good as this looks.